Jr DB Jeff Coplin makes an early interception. 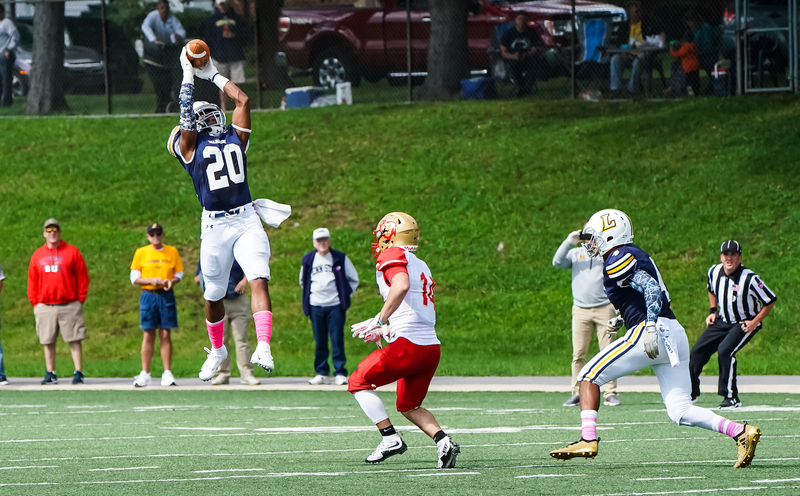 WILLIAMSPORT, Pa. – Despite overcoming a 10-point first-quarter deficit to take a four-point lead in the second quarter, the Lycoming College football team fell victim to 19 straight points from King’s College to close out the game, falling 29-14, at David Person Field on Saturday, Sept. 29, in Middle Atlantic Conference action. King’s (2-2 overall, 1-1 MAC) held Lycoming (3-2 overall, 2-1 MAC) to just 51 yards of total offense in the second half while the Lycoming defense fought to keep the game close, forcing three straight 3-and-outs to start the half. King’s, however, used an interception to get the ball at the 37-yard line and scored five plays later to take a 23-14 lead. The defense continued to keep the Warriors in the game in the fourth quarter, forcing a punt and two turnovers on downs, the second of which was on the 3-yard line with 4:29 left thanks to a big stop from senior Sam Romanofsky (Havertown, Pa./Haverford) and sophomore Matt Kalyan (Auburn, Pa./Schuylkill Haven) behind the line of scrimmage. However, King’s was able to close out the win with a 25-yard touchdown pass from Tommy Klock to Tim Costantino with 4:05 left after getting the ball back off another interception. King’s kicked off the game with a 10-play drive that led to a 39-yard field goal from Jack Barreras and Jayner Garospe got behind the safety for a 76-yard touchdown reception to give the team an early 10-0 lead. The Warriors responded in the second quarter, getting the ball at their own 49 after a punt for their first drive of the quarter and driving 51 yards on nine plays before freshman Elijah Shemory (Jersey Shore, Pa./Jersey Shore) snuck in from a yard out. The Warrior drive was driven by the run game, with Shemory highlighting it with a 16-yard rush to get to the 17. Fr QB Justin Joseph called down by referee cancelling a big run. 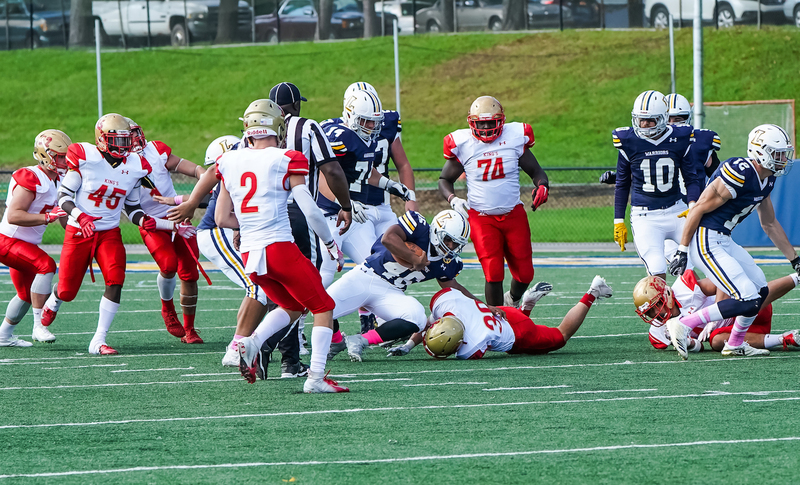 After a 3-and-out by King’s, the Warriors went back to work with another long drive, moving 72 yards in 13 plays, using the feet of sophomore Len Wyda (Berwick, Pa./Berwick) to pile up 41 yards on eight carries during it before Shemory dove in from two yards out to give Lycoming a 14-10 lead with 36 seconds left in the half. However, a squib kick gave King’s the ball at the 41 and two plays later, Klock found Jordan Downes for a 50-yard score to give King’s a 16-14 lead at the break. Wyda rushed 18 times for a career-best 87 yards and freshman Chase Cramer (Andover, N.J./Newton) rushed seven times for 41 yards. Shemory finished 12-of-25 for 109 yards, but he was intercepted three times. Senior Nick Costello (Havertown, Pa./Haverford) caught five passes for 31 yards and senior Mike Mulvihill (Tabernacle, N.J./Seneca) posted two receptions for 32 yards. Freshman Matt Stankiewicz (Olyphant, Pa./Mid Valley) posted eight tackles, 2.0 for loss, and 1.5 sacks to lead Lycoming, while seniorJoe Pinzka (Perkasie, Pa./Lansdale Catholic) added six stops. Matt Kalyan posted five tackles, 1.0 for loss and forced fumble and his brother, Mike Kalyan (Auburn, Pa./Schuylkill Haven) added two tackles for loss. Senior Ahmad Curtis (Effort, Pa./Pleasant Valley) had five tackles and blocked an extra point and senior Taylor Kim (Avondale, Pa./Avon Grove) blocked a punt in the fourth quarter. Romanofsky also had five tackles, 0.5 for loss, and a pass breakup. Klock finished 12-of-21 for 259 yards and four touchdowns. He was intercepted once. Downes rushed 10 times for 65 yards and caught four passes for 68 yards and two scores. Costantino caught three passes for 85 yards and a score. Charles McCall led the Monarch defense with 14 tackles, four sacks, a forced fumble and an interception. Yusef Wheeler added nine stops and Mando Sallavanti posted six stops and two sacks. The Warriors will now enjoy their bye week before getting back on the field by heading to No. 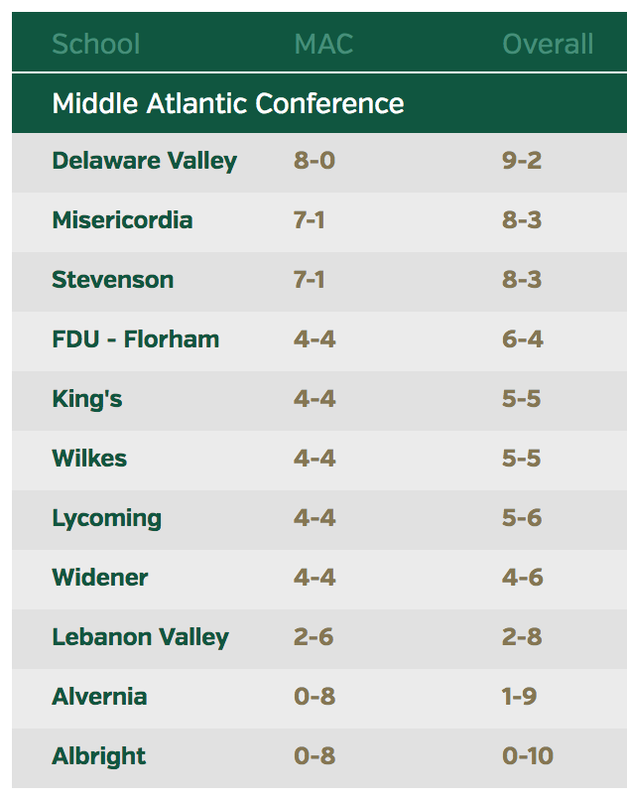 22 Delaware Valley for a MAC contest on Saturday, Oct. 13.